Over an 18-year period we did 10 projects for this church, working with a variety of church committees. We brought this 1742 historic landmark into the 21st century to serve the diverse needs of today while preserving the heritage of a bygone era. 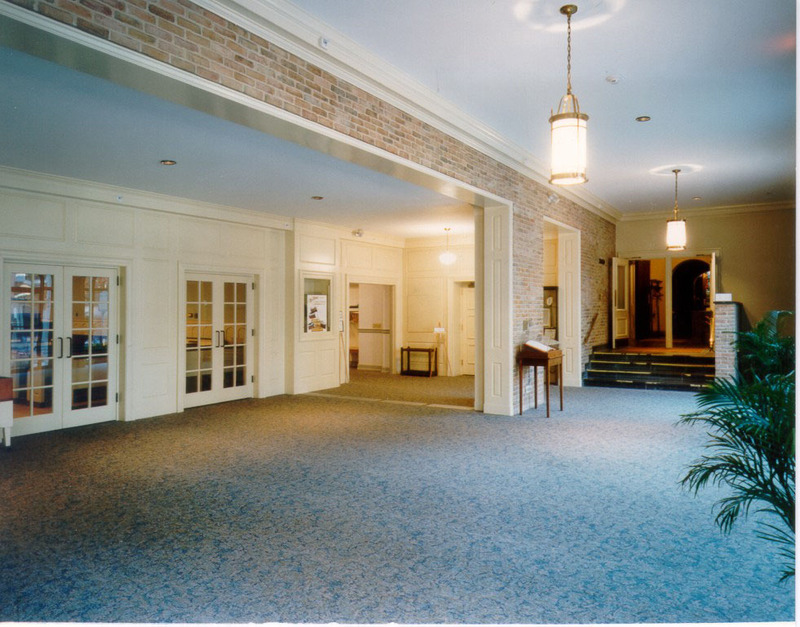 Our projects included renovating the sanctuary, chancel, and choir loft, designing a new lighting and sound system, adding a contemporary worship space, creating a new color theme, providing access for the disabled, new exterior and interior signage, and preparation of a master plan for future growth. 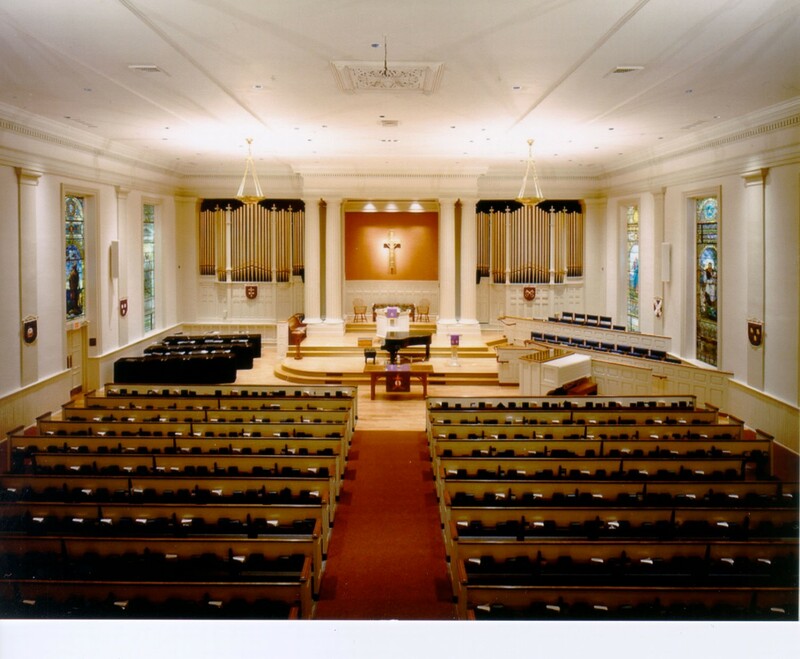 The grandeur of the church sanctuary, built in 1851, was beautifully preserved during the renovation that included changes to the chancel area and choir loft, a new lighting and sound system, and new colors and finishes. Of utmost importance was repairing and cleaning the magnificent stained glass windows, nine of which were made by Tiffany Studios between 1909 and 1923. 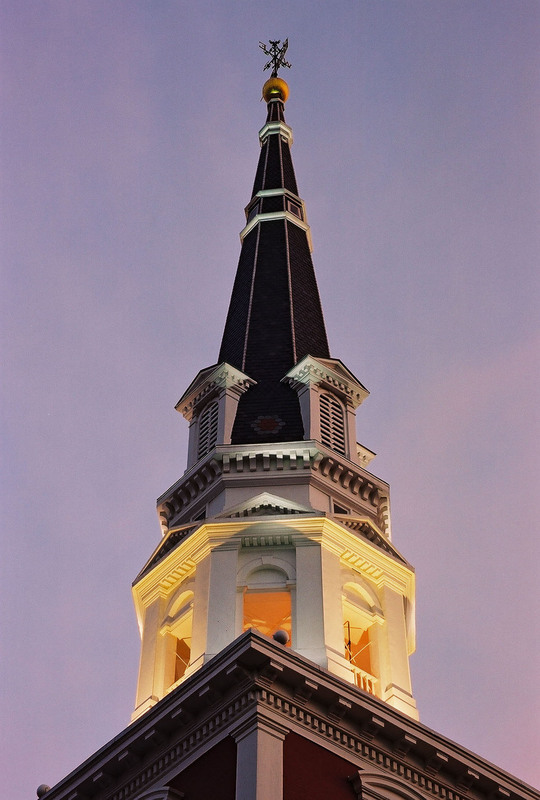 The exterior focal point of the church is the central tower topped by a multi-level octagonal belfry and spire. These architectural features, dating to 1877, were restored during the process of installing a specially designed lighting scheme that included interior and exterior fixtures with different color temperature lamps to showcase the majesty of the tower. Through new interior design the gathering space at the entry to the main sanctuary is now a spacious, well-lit, inviting area with ample room for congregants to mingle and socialize before and after services, without causing congestion or obstructing movement. The choir is delighted with its new rehearsal room. 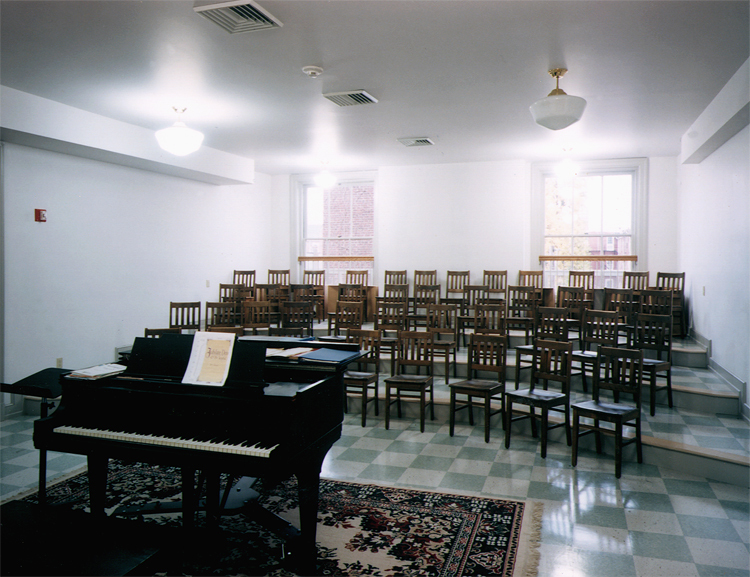 Better lighting, improved acoustics, and easily moved seating makes it easy to adapt the room for a variety of choir groups (from children's choir to adult choir) and expand it for rehearsals for major church festivities where additional musicians are needed for accompaniment. The new contemporary worship and performance space, with stacking chairs, a state-of-the-art sound system, and integrated video system is a huge asset for this inner-city congregation. This new space allows the church to offer a variety of worship and celebration experiences in a non-traditional atmosphere that appeals to the younger, culturally diverse members. A separate, less formal worship and presentation area is a comfortable alternative to the main sanctuary when casual services, guest speakers, and community outreach programs are scheduled. Moveable chancel furniture makes it easy to set up the room for any anticipated size of attendance. The warm, relaxing color scheme and new lighting system built into the existing coffered ceiling provide a cheerful ambiance.